My griddle isn’t heating evenly – is something wrong? Just like electric or gas griddles, portable griddles are subject to hot and cold spots, depending on the location of the burners underneath the cooking surface. Areas that are between burners will not get as hot as areas that are directly over burners. The griddle material can also affect the consistency of the surface temperature, as different metals heat at different rates. How can I best maintain the non-stick qualities of this item? To prevent food from sticking to your non-stick surface, we recommend lightly coating it with oil, wiping off any excess with a soft cloth or napkin. Using sprays on non-stick coatings can actually cause food to stick more readily than using a fat or oil. Sprays can leave a glue-like coating, often missed during the cleaning process, which will begin to build up and cause foods to stick. Additionally, metal utensils should not be used with non-stick surfaces to prevent scratching and damaging the coated surface. Ideal for restaurant, school, or church use, this innovative griddle is capable of performing large cooking tasks on relatively small surface. 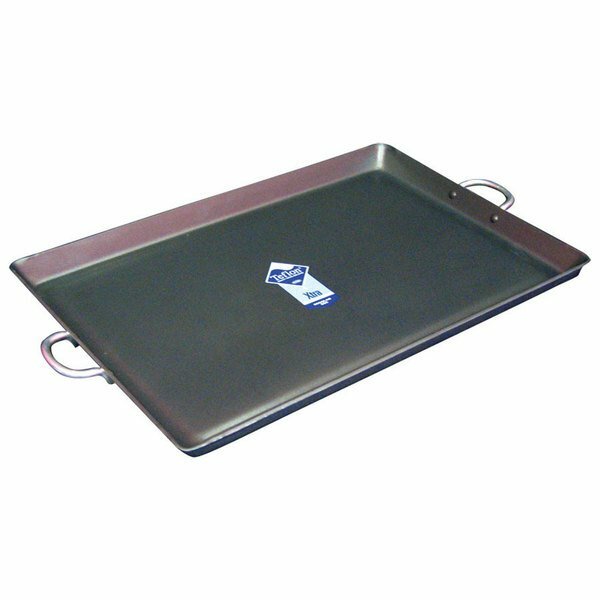 Measuring 23 5/8'' wide and 15 3/4'' high and a non-stick design, this item is best used to turn standard, open top commercial gas ranges into griddles. Heavy-weight aluminum construction ensures lasting durability, while side handles aid in easy transport from one location to the next. I'm so happy I purchased this portable griddle. Makes cooking indoors and outdoors a breeze especially with how hot the surface gets. You're sure to get longevity out of this griddle top. This is a great griddle for my small cafe. We use it on a commercial gas stove, so we have to make sure to keep the heat on medium or less and use only rubber or plastic utensils on it. We make all sorts of grilled sandwiches, quesadillas, etc. It's very handy to have! Very good portable griddle, It is made well, cleans easy, and is non stick as described. The price is right for this piece as well. I really like this griddle. Its size is perfect for my large family, and we use it at least three times a week. The non-stick coating works wonders, especially for making fried eggs. The handles are strong and comfortable, and their placement makes it fairly easy to move the griddle around, even for my 12-year old. It fits perfectly on my gas range and distributes the heat of the burners pretty evenly. One other thing I especially like is the groove all around the perimeter, which one can use to catch grease (say, from bacon) or, as we often do, to cook little sausage links. The lip along the edge provides a second cooking surface for the sausages, so they cook twice as fast. We can easily cook eight pancakes at a time with plenty of room for flipping. Clean-up is really easy, too. I am really excited about this large griddle, not just for my freezer adventures. But for the idea that I can eat with my family... Often times (I currently have a griddle half the size) when the first batch is done (of whatever. Of course I want the family to start eating while the food is hot, while I stand at the stove cooking up the rest. Now I can cook it all at one time. I only wish I had bought it years ago! Can't believe how nice and big this grill is! It is also very thick and the sides really hold in the juices from getting into the open flame. Just the kind of quality I expect and get from you! Perfect in every way! Terrible product, it might be good to use at home, definitely not for commercial range. After the second use, the whole thing bended to a point that you can't even use anymore. Thank you for your review! We're sorry to hear you did not like this product. A Customer Solutions Representative will be in contact shortly. For a more durable griddle, please check out our cast iron Griddles. Awesome product for my 6 burner stove. I can have this on two burners and cook my breakfast items and still have my other burners free. Works great. We purchased this pan to cook tilapia and it woks great for that. Make sure you spray with non-stick spray. Comes clean easily.